Since the 2016 elections, in which the Patriotic Front’s Edgar Lungu was elected President, Zambia’s political atmosphere has been marked by contestation and closing democratic space. Since taking office, President Lungu has demonstrated increasingly authoritarian behaviors, including the prosecution of the political opposition and proposing constitutional amendments that would allow him to extend his tenure in office (Democracy in Africa, 24 March 2017). As demonstrated below, since the surge in riots and protests surrounding the 2016 general elections, there has been a steady number of public demonstrations – both peaceful and violent- across the country. Many of these protests have criticized the scale and opacity of Chinese investment in Zambia. The two countries have been cultivating closer ties recently, as the price of copper–an important export for Zambia– has faltered and the country’s debt has multiplied. A number of by-elections in Zambia since the 2016 general elections have maintained a charged political atmosphere, in which Sino-Zambian relations have come under closer scrutiny. The availability of no-strings attached Chinese finance could be exacerbating these authoritarian tendencies (Kishi and Raleigh, 2017). Fueled by the opacity of the government’s dealings and rampant speculation, Chinese investment in Zambia has become a flashpoint for protesters, rioters, and political opposition — which have, in turn, been met with increased government repression. The politicization and rumor-mongering surrounding Chinese investment could serve as a catalyst for increased political violence in coming months. 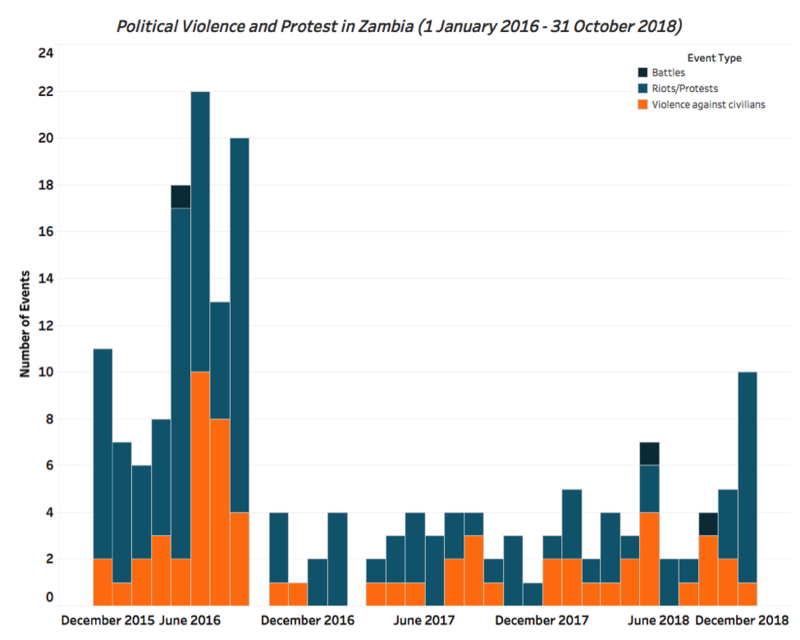 All of the shifts in the nature of political violence and protest in Zambia suggest an increasingly contentious and violent political atmosphere in Zambia. These patterns themselves are the product of an increasingly authoritarian incumbent, opaque government processes, a number of by-elections in July and November 2018, an opportunistic political opposition, and a weak economy. In 2018 thus far, there have been 26 riots and protests – an increase from 21 such events that had been recorded at this point in 2017. Both 2017 and 2018 mark a significant decline in the number of riots and protests as compared to 2016, when there were 75 such events between January 1 and November 24. A number of recent demonstrations have addressed Sino-Zambian relations – including a demonstration in mid-November by supporters of the ruling party who were protesting increased xenophobia in the country, particularly directed towards Chinese people in Zambia. Many of the protests and riots in 2016 were in response to the political campaign and subsequent inauguration of Lungu. In 2017, six activists were arrested for protesting a $42 million “firefighting procurement deal” that they alleged was corrupt (News24, November 19, 2018). A notable change in the characteristics of riots and protests in 2017 and 2018 are their composition and their location. Rioters have been more active in 2018 than in 2017. In 2018 thus far there have been 15 events involving rioters, as compared to 9 in 2017 over the same time period. As compared to 2017, there has been nearly a 50% increase in the number of riots that the state responded to in 2018. These confrontations have resulted in 3 reported fatalities — one more fatality than was reported in association with the 25 such events in 2016. This suggests that interactions between rioters and the Zambian government are getting more heated and lethal relative to such events in 2016. This pattern has been accompanied by a decline in the number of events in which rioters act without state response. There were three events in which rioters acted independently between January and November 14, 2017. There has been just one such event in 2018 to date. At the same time that events involving rioters have been on the rise, there has been a decline in the number of events involving protesters. There have been 11 events involving protesters in 2018 thus far, as compared to 12 such events over the same time period in 2017. There has been a slight decline in the number of protests that the state responded to – down from 5 such events in the first 10 months of 2017 to 4 to date in 2018. 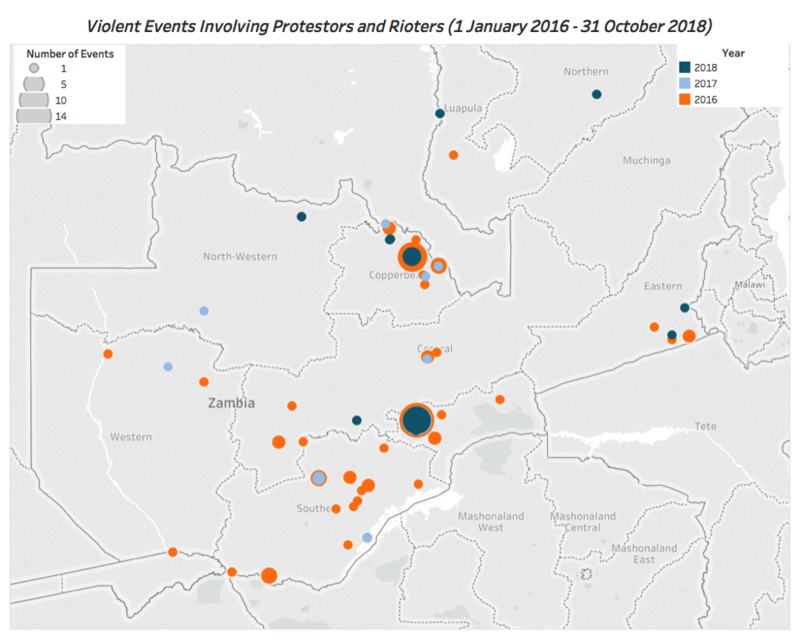 As illustrated below, protests and riots in 2018 have concentrated in Lusaka (the capital), the border region with the DRC, and the country’s northeast — all areas that were won by the opposition in the 2016 elections. Activities involving political militias have also increased in 2018. In 2018 thus far, there have been 12 instances in which political militias have targeted civilians, as compared to three such events in 2017. Though 5 of the events in which political militias targeted civilians 2018 thus far have been attributed to Unidentified Armed Groups (UAGs), there have also been instances of militias affiliated with both the ruling party and the opposition that have engaged in violence against civilians. Revelations concerning the amount of Zambian debt –revealed to be $9.4 billion in June 2018–have put pressure on incumbent President Lungu, both from Zambians and the international community (Al Jazeera, 11 October 2018). Zambia under Lungu has sought financing from a variety of sources to stabilize the country’s economy – including from China. At the Forum for China-Africa Cooperation in September 2018, “Zambia secured a 30 million interest-free loan and $30 million grant” (Voice of America, 11 September 2018). Though government representatives asserted in late September that the majority of their creditors are not Chinese, rumors continue to swirl that the government is considering selling state-owned enterprises (such as the country’s electrical company, Zesco, to the Chinese (Quartz, 18 September 2018). The uncertainty about the country’s financial situation is fertile ground for speculation. As the economist noted in September, “China now holds perhaps a quarter to a third of Zambia’s external debt. (No one knows how much—itself a cause for concern. )” (The Economist, September 15, 2018). Rumors have served as the basis for riots and protests. According to some assessments, “public concerns that the country’s sovereignty is under threat” from the Chinese are on the rise (Mail and Guardian, 16 November 2018). A 2018 riot “began as a protest against the rumoured sale of state-owned timber company Zambia Forestry and Forest Industries Corporation (Zaffico) to the Chinese,” a measure that was believed to be a potential result of the inability of the country to repay its debt (Mail and Guardian, 16 November 2018). The political opposition has stoked these rumors, and “has put China’s debt dominance at the forefront of its campaign to unseat the government” (News24, 23 September 2018). The political opposition is able to may hay from the country’s economic situation because the country’s debt as a proportion of GDP has more than doubled since the ruling Patriotic Front came to power in 2011 (Quartz, 18 September 2018). President Lungu’s repressive response to challenges to his political power and concerns about Chinese investment has exacerbated the situation in Zambia. In addition to an increase in the number of riots dispersed or responded to by the government (and the lethal consequences of such interactions in 2018), Lungu has overseen the detention and arrest of political opponents. Opposition leader Hakainde Hichilema has been arrested a number of times, including in 2017 when he was charged with treason (Al Jazeera, 12 April 2017). Hichilema was interrogated in mid-November of this year over comments he made about Chinese investment, which the government considered seditious (News24, 20 November 2018). According to Nic Cheeseman, “the democratic backsliding taking place under the Patriotic Front is rooted in the fact that Lungu is one of Africa’s least secure political leaders. Constantly on the verge of losing power, he has fallen back on intimidation and coercion in the absence of major policy successes that he can sell to the Zambian people” (Mail and Guardian, 16 November 2018). The dynamics at play in Zambia are only likely to intensify in coming months. In December 2018, the Constitutional Court will determine whether or not Lungu is eligible to run for a 3rd term (Zambian Observer, 19 November 2018). Regardless of the court’s decision, it presents the potential for an escalation in political violence and protests in the short-term – regardless of how it is decided. 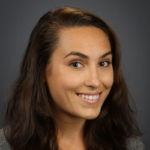 Some research on the effects of Chinese official finance finds that it is linked to higher levels of state directed violence against civilians and the political opposition (Kishi and Raleigh, 2017). Increased ties between Zambia and China, if characterized by no-strings-attached financing, could thus result in greater government repression in the medium- to long-term. The political opposition’s propensity to rumor-monger about the Sino-Zambian relations also presents a threat to the country’s stability. Not only could the politicization and fear-mongering over Chinese investment trigger riots (and a violent government response), it could also foment violence against Chinese residents. The Zambian government must resist the urge to obfuscate the nature of Chinese investment in Zambia and repress political opponents. The government’s opacity and repressive tendencies only make the accusations levied by the opposition about a predatory and exploitative relationship more credible. In turn, however, the political opposition must also refrain from trafficking in speculation or campaigning on misinformation.